ike the double headers in baseball, the double feature at the movies has become a relic ofthe past. In every way, going to see a film is far different from the experience I had growing up in the Bronx and plunking down my coins to see a movie. Yes, I did write “coins,” because the time I’m writing about, the ‘40’s and early ‘50’s, was a period of inexpensive moviegoing. During the war years, a quarter was enough to buy a ticket and, depending on the theatre, even have money left over for a Clark Bar or Mason’s Dots, my cavity-creating candies of choice. 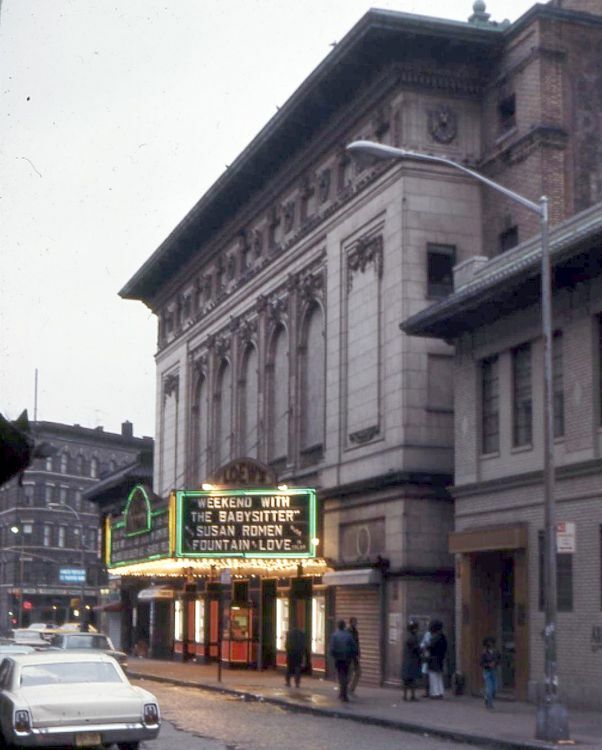 Living in the East Bronx, I had a choice of several movie theaters, all in a non-consecutive line running from the Freeman, on Freeman Street and Southern Boulevard, running south to the Star, where Southern Boulevard merged with 163rd Street and Hunt’s Point Road. There were still three other movie houses between either end: the Art, the Loew’s Boulevard and the Loew’s Spooner. While none of them showed first run features, there was a definite hierarchy with the Boulevard at the top, followed by the Spooner, and the three lesser lights bringing up the rear. The differences among them were not really a matter of size alone. In a kind of reversal of baseball, in which players worked their way up from the minor leagues to the majors, the movies worked their way down from Manhattan to the Bronx, although actually moving up geographically. So when a movie had played the Roxy or Paramount or another Manhattan showcase, it made its way to the Paradise, with its celestial ceiling, and from there on a downward spiral to the Boulevard or Spooner, landing at last in the Freeman. The Star and Art seemed to settle for those “B” movies that no other theater deigned to show. As a boy during World War II, movies meant going on Saturday morning. Because the Freeman was closer to my apartment building, that was my usual destination, sometimes in the company of my older brother, but other times alone. The theater itself was next to an old fashioned Manufacturer’s Trust Bank and its marquee was shaded by the elevated tracks above. On Saturday mornings, the doors opened at nine or ten, and even before tickets were sold, a line would have already formed with wriggling elementary school kids anxious for their Saturday ritual. After buying a ticket, I would walk up the sloping lobby to the candy counter to be fortified for the long day ahead. Awaiting me was a double feature, several coming attractions, a newsreel, an episode of a continuing serial known to us as “chapters,” and two or three cartoons. The Freeman had still another enticement on those long gone Saturday matinees. As you entered the theater, you were given a card or disk with a number. The number corresponded to a contestant in a series of Keystone Kop imitation races. They were called “Funny Races.” If the contestant whose number you had won the race, you received a prize. The prize was a candy bar or an iron-on patch with your elementary school number, or some other bagatelle. These filmed races featured vintage cars and other wheel-driven contraptions with numerous obstacles for the contestants to overcome. To the audience of pre-adolescents, they were funny and exciting.. In those days, before television antennas began to sprout from tar covered rooftops, along with radio programs, going to the movies was the major source of entertainment The movies reflected a more innocent time. The Hayes Office, as part of the industry’s voluntary self-censorship, guaranteed only chaste scenes. Of course, there were no ratings needed to guide you because all of them were meant for family audiences. Bogart may have kissed Bergman in “Casablanca,” but anything beyond that led to a fadeout and the viewer’s imagination. It was in the darkened theater that you could see John Wayne singlehandedly defeat the Imperial Japanese Army, although in reality his deferment kept him from actual military service. What a shock it was to learn later that the handsome Alan Ladd, the heroic Shane, often had to stand on a raised surface to appear taller than his leading lady. The movies took us away from the reality of our working-class Bronx lives, presenting possibilities and giving impressionable kids models to emulate. Jimmy Stewart and Gary Cooper were exemplars of “Aw shucks” modesty and served as role models for decency and dignity. For the ethnic kids, as most of us were, the movies showed us an idealized America, far different from our noisy streets and crowded apartments. Although we knew that there was a real world opposed to the one depicted in celluloid flickering images, we suspended disbelief and accepted Edward G. Robinson and James Cagney as on-screen tough guys, despite the fact that the former was an art connoisseur and the latter a soft-shoe dancer. The movies were an escape from the mundane nature of school and neighborhood, and entry into a world more exciting and inviting. Gradually, as television antennas became more like rooftop forests than the stray weeds they once had been, the little box in our living rooms presented a more convenient alternative to movies. Fewer and fewer people went to the theaters. The Art, always a poor relation, began to show Spanish films in recognition of the changing population. The Freeman followed suit, and, finally, the Boulevard and Spooner closed their doors forever. Although movies had traditionally moved from downtown to uptown, theater closings happened in the reverse order. The Strand, the Paramount, the Roxy, the Loew’s State experienced the same fate as their poor relations in the Bronx and gradually went out of business. An era had ended. My wife and I still go to the movies, but only if there’s a film we really want to see. Even at senior citizen rates, the movies are expensive, and the nickel candy bar has been replaced by its three-dollar counterpart. There are no more serials, and I can’t remember the last newsreel I saw. The single theater has been replaced by the multiplex showing eighteen movies I don’t want to see, and I doubt that I could even sit through a double feature. But each time I hear that MGM lion roar, I think back to those Saturday mornings in the Freeman where I sat engulfed in the darkness of a dingy theater and the glowing world portrayed on its silver screen, absorbed in its projected unreality.